Today I had my super fun annual “female” physical. Let’s all let out a collective groan, huh ladies? While I don’t ever look forward to this annual event, I do have to say that going to the doctor makes me feel pretty great most of the time. Just when I’m feeling down on myself for eating crappy food or not exercising enough, I see my doctor, answer all of her questions and I remember that I’m really lucky to have great health. No, I don’t workout every day. I don’t eat the most healthy of foods all the time, heck some days I don’t eat anything that’s green. But I don’t smoke, never have. I drink only socially but aforementioned hangovers usually keep me from going overboard on drinking anymore. I always wear my seatbelt. I know that doesn’t make me healthy but I love when they ask me that and I can honestly answer with a “Yes. Absolutely. Every single time I get in the car.” I don’t do any drugs. I am, for the most part, a truly healthy 28 year old. One thing that always makes me a little sad when I see a doctor, is their apparent shock when I tell them I don’t take any medications. Are we really such a medicated nation that I’m the minority because I don’t take any prescription drugs?? When did being medicated become the norm? I understand that many people take medications for very valid reasons but I couldn’t help but do some research when I got home this afternoon. First of all, I was curious just how many prescriptions are filled in the U.S. each year. Any guesses? I don’t think I ever would have come up with this number. So that means (correct me if I’m wrong, math isn’t my strong point) that for every person alive in the U.S. in 2010, there were 12 prescriptions filled. 1 prescription per month per person? I guess when you put it that way, it isn’t so scary. But honestly, that’s a whoooole lotta prescriptions. The tenth most popular drug treats high blood pressure, one of the major risk factors for heart disease and stroke. About 1 in 3 American adults currently have high blood pressure, which is more common among older adults, the overweight or obese, people with a family history, smokers, people who don’t exercise and African Americans. Type 2 diabetes, the kind linked with obesity, affects 25.8 million Americans, or about 8% of the total population, and an estimated 7 million people are undiagnosed. What’s more, 79 million people are estimated to have a condition called pre-diabetes, in which patients have impaired glucose tolerance and are at high risk for developing diabetes. In 2010, 1.9 million new cases of diabetes were diagnosed in people aged 20 years and older, according to the American Diabetes Association. Metformin is commonly used to control blood sugar in diabetes patients. Antibiotics can be used to treat infections of the nose, throat, skin and urinary tract but they cannot cure colds or flu, which are caused by viruses. Nonetheless, millions of prescriptions are written to try to treat these illnesses — improper use that is contributing to the increasing problem of antibiotic resistance. Like amoxicillin, azithromycin is used to treat common bacterial infections, including lung infections and some sexually transmitted infections. About 20% of Americans suffer from stomach pain and burning related to acid reflux at least once a week, resulting in the popularity of Prilosec. Risk factors for acid reflux include obesity and cigarette smoking. The risk of developing high blood pressure increases with age, affecting about two-thirds of people over 60 (note: the oldest of the country’s 77 million Baby Boomers are turning 65 this year) — one reason that blood-pressure medications make up three of the top 10 most prescribed drugs. A common cause of low thyroid hormones, primary hypothyroidism affects 9% of women and 1% of men. Symptoms include slow speech, lack of energy, weight gain, hair loss, increased sensitivity to cold, and dry, thick skin. The risk of hypothyroidism increases with age, which accounts in part for the increasing number of prescriptions written. Out-of-control stress contributes to high blood pressure, which helps explain why the condition may be more common in the poor and in people whose jobs have high levels of responsibility but little control over outcomes. Nearly 36 million Americans have high cholesterol levels, high enough to more than double their risk of heart disease and stroke and to keep rates of prescriptions for cholesterol-lowering statins sky high. Vicodin is prescribed to treat chronic pain, which affects 20% to 30% of adults and is twice as common in women as in men. The pill is also commonly prescribed to treat pain following dental procedures. Though drug misuse may account for part of the reason that hydrocodone is so popular, fewer than 3% of people prescribed opioids for chronic pain actually develop new addictions. Notice the bold-faced words in the drug descriptions? Those are all of the conditions, treated with these drugs, that are in our control. That’s right, people, we actually have control over many of these conditions and don’t have to rely on prescription drugs to keep things in check! I know that family history plays a HUGE part in many of these conditions as well but obesity, smoking, not exercising, STDs, we can do something about all of those things! What I’m getting at here is plain and simple. 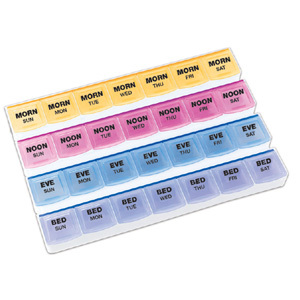 We don’t need to rely on medications to keep us healthy. If we all do a little something to keep our bodies moving, we don’t have to be a nation that lives on drugs, quite literally. I am grateful that the drugs exist for those that really need them but I do find it sad that doctors are so prescription happy. It’s as if they’d rather write out a prescription than help a patient deal with their stress or teach them how to be healthier and lower their cholesterol. And that, to me, is sad. I’ll now step down from my soapbox but what do you think? Do we, as a nation, rely too much on prescription drugs to keep us feeling good? What do you think of alternative medicines? As stated before, I think it’s sad that doctors are so eager to write a prescription rather than set up a patient on some sort of a plan to try to remedy their condition in a healthy manner. 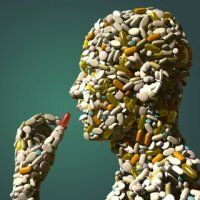 If faced with a serious condition, I think I would try alternative medicines to try to manage my condition before turning to a pill cocktail.